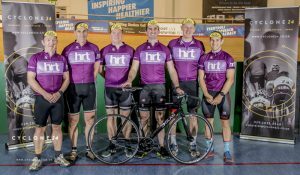 This month our rider interview comes from Gavin Rees, Director at Herbert R Thomas. Fresh from completing Cyclone24 at Newport in October, we asked Gavin for his thoughts on taking part. My wife bought me a one hour track taster session as a birthday gift. I did the session in March and loved it. I saw Cyclone24 advertised at the Velodrome and persuaded my business partners to enter a team. None of them had any track cycling experience. It is a unique challenge testing both physically and mentally. I’ve previously completed the British and Welsh Three Peaks Challenges. I have also run half marathons and other events, so with this being so different it really appealed. I took part in a number of track training sessions which really increased my confidence and track skills. Along with a few turbo and road training sessions whilst training for the Cardiff Half Marathon. I loved the whole event, from the nervous energy before the start to the euphoria of reaching noon on the Monday. There was a great spirit between the teams and a great atmosphere when the winning team beat the previous laps record. Watching some of the elite cyclists trying to break the lap record was also fantastic to experience. Individually and as a team we really enjoyed the morning session, we had our best rides and seemed to be getting stronger. Go for it, you will not regret it. Get as much track training done as you can. Buy a big tub of Chamois Crème. 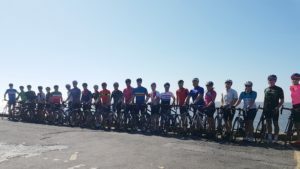 In taking on the challenge, Gavin and his team from Herbert R Thomas also raised a huge £1,600.00 for their chosen charity Barnardo’s Cymru – an outstanding fundraising effort. Congratulations to you all and we hope to see you on the boards again soon!